Just to let all members know that our playing calendar has been updated until the end of 2019. Copies can be seen both on the blog CALENDAR and PAPERWORK pages. You will note that CLUB CHAMPIONSHIP competitions have been included for Mixed Pairs, Open Pairs, Ladies Pairs, Mens Pairs, Triples and Singles. Entry posters will be displayed on our club notice board so start thinking about your team. Obviously not everyone will want to enter and so social play will take place at the same time on these days. We will also fit in our usual club social competitions over three rounds but the Club Championships will be decided by either league and knockout or round robin depending on how many folk enter them. The calendar includes numerous events at other Northern clubs, some open to all players and some for licensed players only. They are all worthy of a visit to play other players across our Northern region. If anyone needs assistance in entering competitions at other Northern venues please let me know and I will help. This entry was posted in Uncategorized on February 17, 2019 by clive1westley. Just a couple of weeks ago we were really pleased when 46 members turned out to play. However, today’s mild, sunny weather attracted an amazing 50 members to our terrains. This we firmly believe is a record for our club and is an excellent indication of how popular our sport has become. 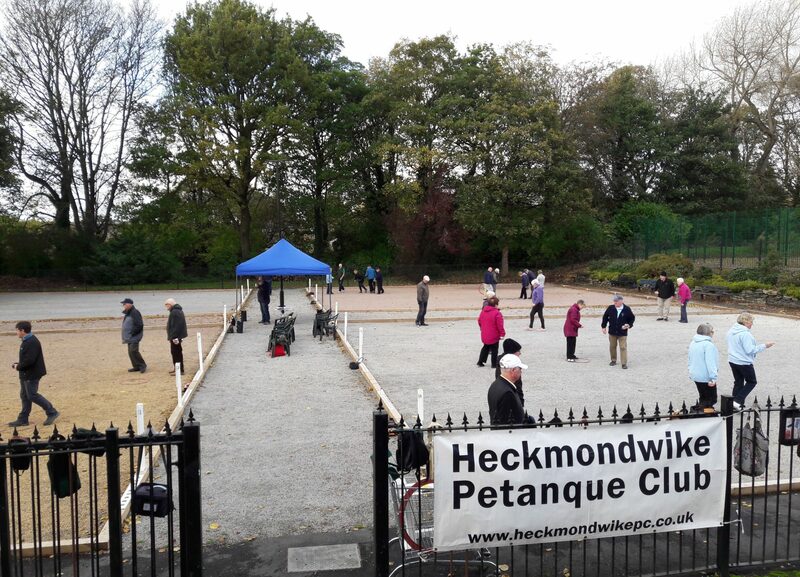 Hope the French are taking note and vote to include Petanque in the 2024 olympics in Paris when they make their decision later this week. This was just a social play day. No major competition and certainly no prize money, just a brilliant way to spend three or four hours with good friends playing a great sport. Long may it continue. This entry was posted in Uncategorized on February 16, 2019 by clive1westley. Having failed due to bad weather on Saturday last we tried again today in very mild, sunny conditions to hold our annual Valentine Mixed Pairs Competition with a three round Snake. With 19 gents and 17 ladies we found a couple of lads willing to balance the odds. So 18 pairs started a three round snake and all went well until four players had to leave after just two of the three games. Unfortunately this disrupted the rhythm of a few pairs who had to break up and make new teams for the last round. Sorry to everyone whose enjoyment and winning prospects were spoilt by the early departures. I know at least two teams who had won their first two games had one person leave before the third game. That is not to detract from the teams who went on to complete their three planned games of the Snake format. Four teams succeeded in winning all three games. In fourth place with three wins and plus 12 points were Jean McCullock and Walt Bottrill. Pauline Fenton and Colin Child took third place with three wins and plus 24 points. Alma Johnson with Ken Hutchinson scored three wins and plus 28 points for a creditable second spot. 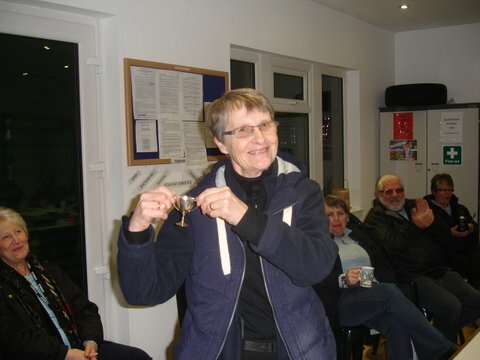 However, todays champions were Cath Clegg with myself with three wins and plus 32 points. Cath will, of course, get a slightly larger trophy than the one pictured above from earlier glory. FULL RESULTS CAN BE SEEN ON THE RESULTS PAGE OF THE BLOG. Perhaps in future competitions we may have to ensure folk commit to all three games before starting and if unable to do so they play socially outside of the competition. 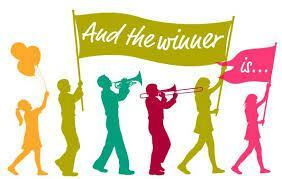 Thoughts are also that we can run Members Championship Competitions whereby players pre-enter their teams. Those members not wishing to enter the championship would play socially at the same time. Championships could be held for Singles, Ladies Pairs, Gents Pairs, Mixed Pairs, Triples and Open Pairs. It is likely that the competitions would involve more than three games. eg leagues and knockout. Thoughts invited. While it’s our Month End Melee coming up on Saturday 23rd Feb I must mention that on Sunday 3rd March we host a Northern Winter League Pairs competition. It’s a good chance for members to play games against players from around Northern Region over five rounds. They are an excellent opportunity to gain experience and practise tactics. Get you names entered or let me know and I’ll enter your team for you. This entry was posted in Uncategorized on February 13, 2019 by clive1westley. Hi All, In view of today’s weather it would be unsafe to play on terrains surrounded by the trees. The rain will not make the situation any better. We will be there for a cuppa at 10am but the competition is cancelled. We may try it on Wednesday. This entry was posted in Uncategorized on February 9, 2019 by clive1westley. 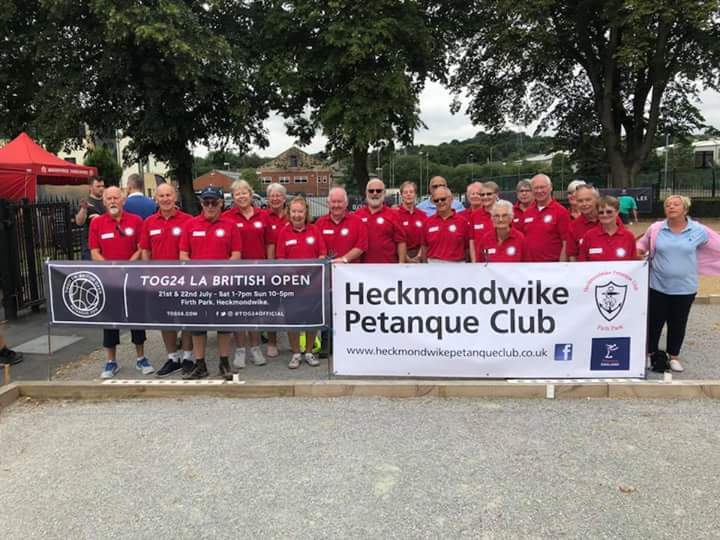 It may seem like it was only yesterday that this picture was celebrating a fabulous petanque weekend as LA BRITISH OPEN was introduced to the petanque world. It may be just the beginning of February and snow is on the ground but the blue touch paper has been lit. Yesterday the entry facility was launched via Facebook and within 24 hours there are 15 teams already entered. We had 34 teams last year and luckily we’ve set a limit of 64 teams so no need to panic just yet. However, don’t miss the chance to play against some of the best players in both UK and Europe. Join Northern as an Associate member, get your triple team together and get yourselves entered. La British Open facebook site will lead you through the process including the bank details to pay the £30 for your team entry. (£10 per player). I’m hoping all of the wonderful red shirted members pictured above will once again be keen to join the team of helpers who made the event a brilliant success. It takes place on the weekend of 13th/14th July. Anyone wanting to join the team, be it for one of the days or both or even just in the preparation beforehand please let me know. We will be holding a committee meeting in a couple of weeks to make plans but we already have our own Andy and Beverley who will provide Crepes and possibly Pizza as well. Could be we have a plan for a repeat of a brilliant cake stall too if we have some keen bakers. There will be loads to do to cater for the extra teams which will include bringing our old terrain back into use plus constructing a couple of extra pistes in the multi-sport arena. We will hope to attract some sponsors to help with trophies, prize fund etc. Anyone who feels able to provide sponsorship or knows of small companies that might be prepared to help us please let us know. More details will follow soon as our planning progresses. This entry was posted in Uncategorized on February 1, 2019 by clive1westley. Today we started the 2019 season of month end melees, and did it by celebrating a record turnout of 46 members. This on a day that had been promised rain, strong winds and falling temperatures. As ever with forecasts, it was a balmy 7-8 degrees and the rain didn’t appear until long after we had finished. If any of our council mentors are reading this please note it was standing room only in the pavilion even after a few members had left for home. It’s a safe bet that in summer this pavilion is going to prove too small for our growing club. Of the 46 players a confident looking 11 of them sailed through two rounds with wins and high hopes of that third win and ultimate glory. As usual with this three round format, 7 of those 11 fell at the final hurdle. Just four players managed three wins from three games. With three wins and plus 16 points Lynne May came fourth. In third place was Darren McDonald with three wins and plus 20 points. Just two points ahead was Bev Whittington on 3 wins plus 22 points. 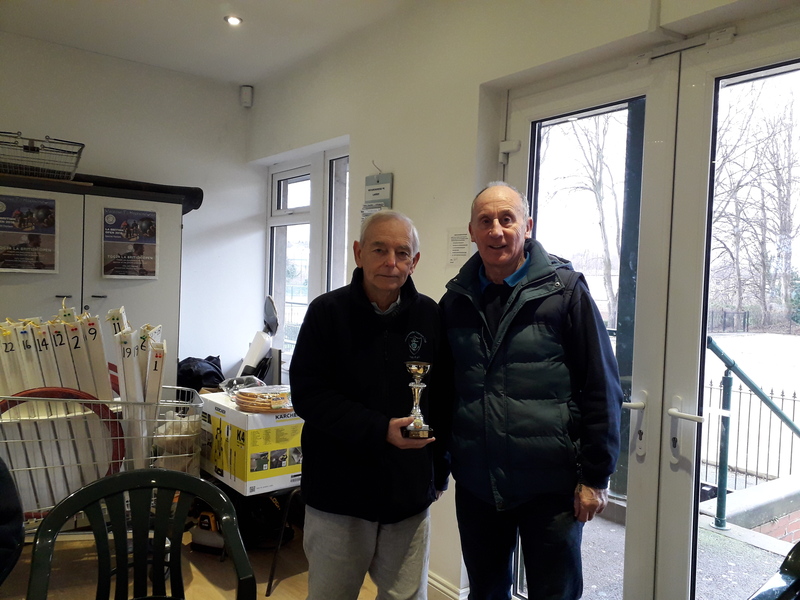 This month’s champion, however, was Alan Wallace with a fine 3 wins and plus 26 points. Well done to all four on their three from three success. This year we are simply counting games won rather than awarding points. Points difference will obviously prove crucial at the end of the year. In the event of players tying on games won and points difference the higher placing will go to the player who played least games to get those wins. Whatever system is in place you still have to be there to win. The full results plus the current massive points league table can be seen on the RESULTS PAGE of the blog. This entry was posted in Uncategorized on January 26, 2019 by clive1westley. We received the very sad news this week that one of our members, Peter Watts, collapsed and died on Wednesday. Our thoughts and condolences go out to his wife, Elaine, and their family.